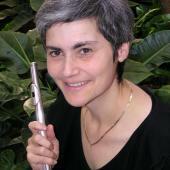 Sue-Ellen Hershman-Tcherepnin first appeared with the Boston Symphony Orchestra as flute soloist at the age of 16, and has subsequently performed throughout Europe, Latin America, South America, Russia, China and the US as both soloist and recitalist. With pianist David Witten, she frequently performs as a member of Dúo Clásico. Since 1986 the Duo has represented the US on State Department-sponsored foreign tours.